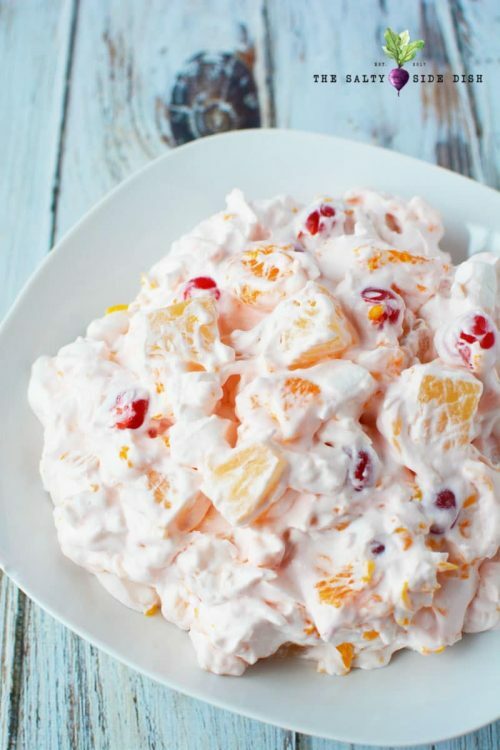 Ambrosia salad recipe with with cool whip, fruit and marshmallows is the perfect for your upcoming picnic. Kid friendly with just the right amount of sweet, this is a classic recipe that will remind you of what grandma used to make! Its so easy to get caught up with side salads during the spring. And I do love me some cucumber tomato feta salad, Caprese, and even zesty Italian pasta salad pretty much any day of the week. 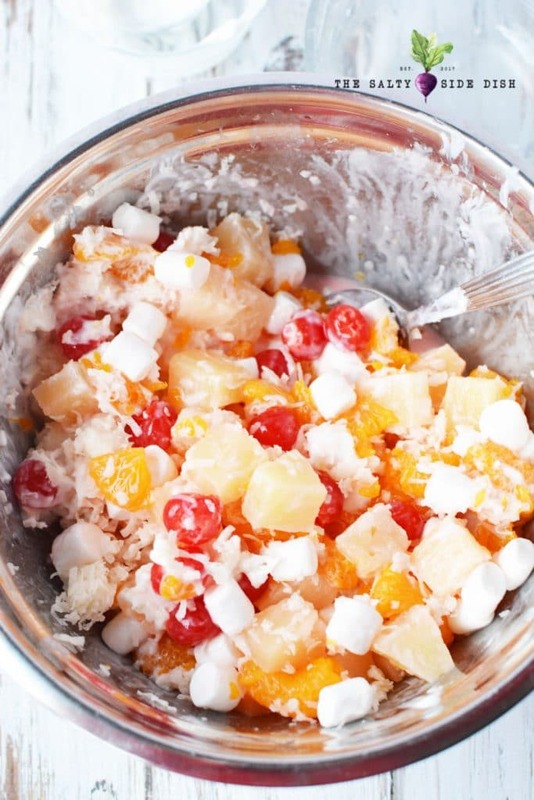 The cherries, oranges and pineapples allow the citrus of the fruits to mix in gently with the cool whip and yogurt. While I wouldn’t call this summer salad healthy, it is a perfect mixture of all things spring and summer and will probably remind you of your childhood. What I love about this recipe is that its minutes, I mean minutes, until its done! I think it can be so stressful to have to prep meals and this ambrosia salad is basically a dump and mix scenario. You just want to make sure you have enough time to let it sit in the fridge and get cold. 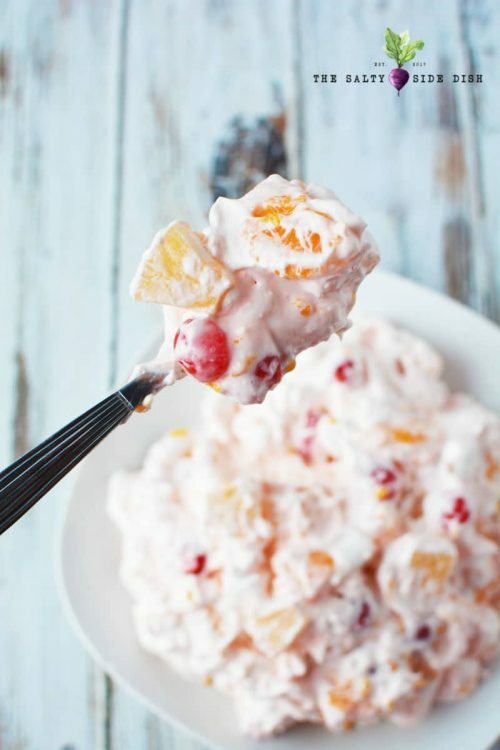 To get started on your Ambrosia Salad recipe, make sure your fruit is all drained and prepped. 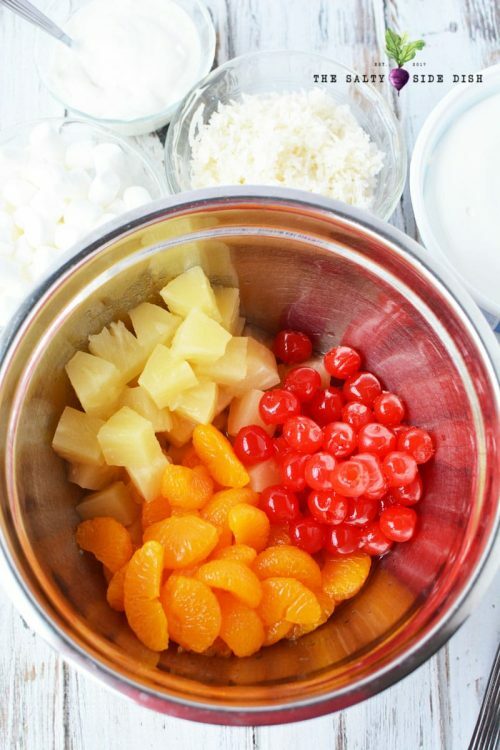 Then mix your oranges, pineapple and cherries together in a mixing bowl. Add greek yogurt, shredded coconut and marshmallows and mix well. 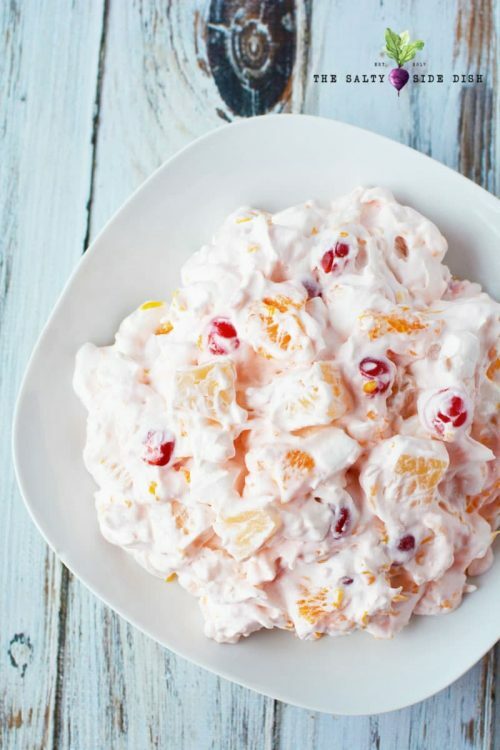 In this ambrosia salad recipe we used a vanilla Greek yogurt. I like the consistency and flavor, but its OK to experiment and try flavors like strawberry and cherry yogurts as well! Do not feel married to this recipe if you know that you love a flavor of something else. Half the fun in the kitchen is making it your own. 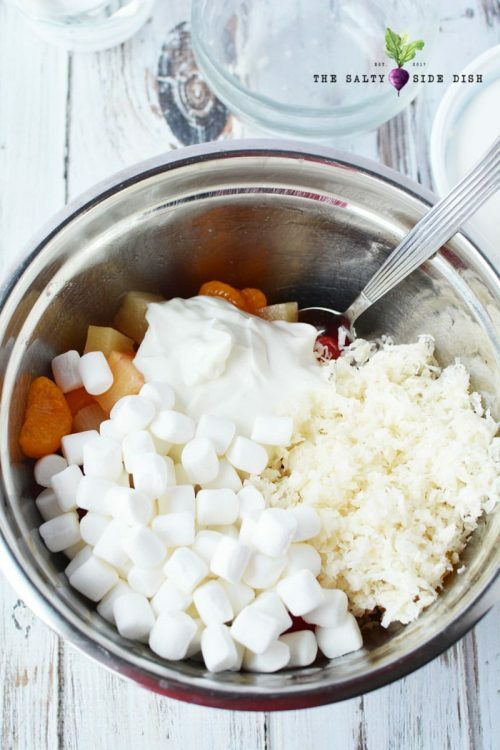 Fold in whipped topping slowly, making sure you cover all your fruit and marshmallows. Refrigerate your salad with the bowl covered for atleast 4 hours or overnight if you can to really solidify the flavors. Because this salad has diary in it, putting it in the heat outside for long periods of time is not recommended. Stir before serving to ensure equal flavoring. 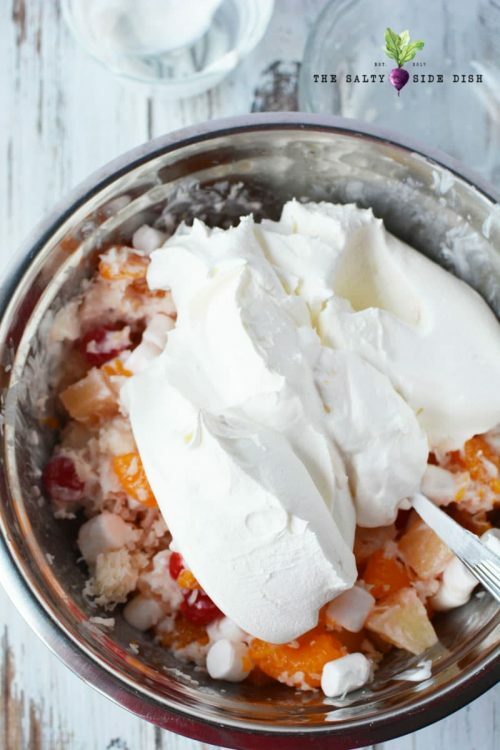 Classic ambrosia salad with with cool whip, fruit and marshmallows is perfect for your upcoming picnic. 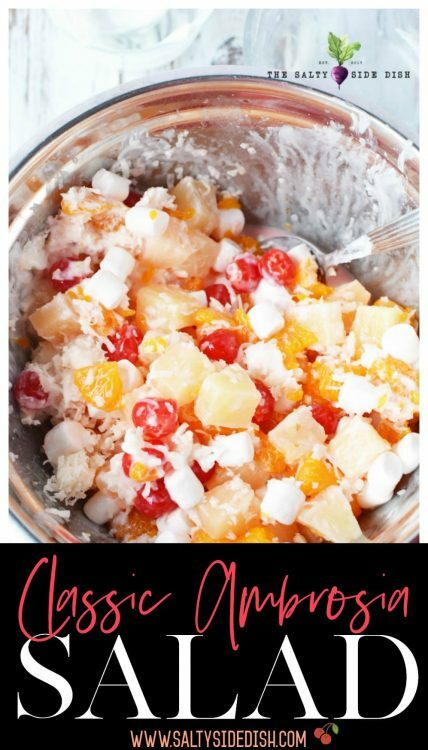 Kid friendly with just the right amount of sweet, this is the best ambrosia salad recipe that will remind you of what grandma used to make! 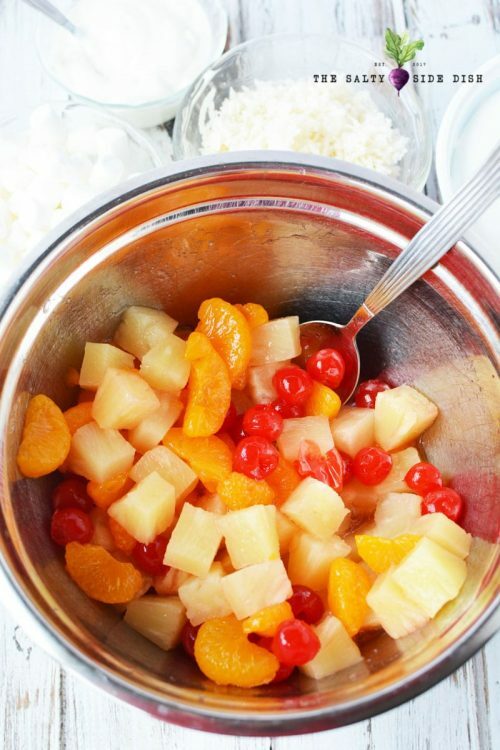 Mix oranges, pineapple and cherries together in a mixing bowl. Add yogurt, coconut and marshmallows and mix well. Fold in whipped topping. Refrigerate, covered, for 4 hours or overnight. Stir before serving. Do not forget to pin me! This was one of my FAVORITE side dishes that my Nana would make on the holidays! Now I am craving some!